Read the previous entries: Day 1/2, Day 3, Day 4, Day 5, Day 6, Day 7, Day 8, Day 9, Days 10/11, Day 12, and Day 13. 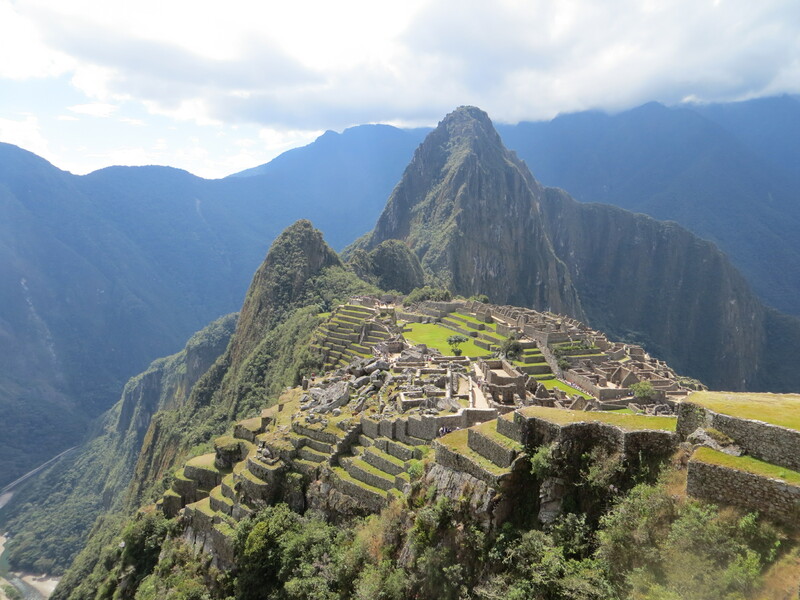 While Karl Pilkington from An Idiot Abroad describes Machu Picchu as “Bungalows made from rocks with the roofs missing,” I’m one of the millions who’ve been totally enchanted by it. From the Sun Gate where we got our first glimpse to our return on the last day of our trip, I found this city in the clouds more amazing than I’d ever anticipated. Our tour began with a look at the plaques near the entrance. Although most are boring at best, the historical signs at Machu Picchu have a bit of a backstory. The Rotary Club put up the first one in honor of Hiram Bingham, who most people considered the “discoverer” of Machu Picchu at the time. Bingham was a historian, avid reader, enthusiastic explorer, and amateur archeologist. By sheer pluck and lack of competition, he managed to create two academic positions for himself – one as curator of the Harvard Library’s South American collection and another as a lecturer at Yale lecturer. His expeditions seemed to consist of hearing about rumors, digging up historical records with hazy details, asking local people if they had seen ruins nearby, and then hiking around until he found something interesting. Bingham is supposedly one inspiration for Indiana Jones and would fit in perfectly in the now defunct Adventurers’ Club in Disney. He “found” Machu Picchu in 1911 while he was looking for the Incas’ last stronghold against the Spanish. Despite evidence otherwise, he found the city so amazing that he declared it must be the “Lost City of the Incas.” These days, historians speculate that Machu Picchu was a royal summer retreat or possibly a holy site that they abandoned to protect it from the Spanish. We reached the main site by walking along one of the many agricultural terraces ringing the buildings. The city housed 800 to 1000 people, not including the thousands it took to build it, all of who needed to be fed. Our modern urban planners could learn a lot from the Incas about integrating agriculture into living spaces. Just as they didn’t waste a bit of land, the Incas also carefully managed their water supply. Irrigation ditches carved out of stone ran along the terraces, notched every foot to release just the right amount of moisture. 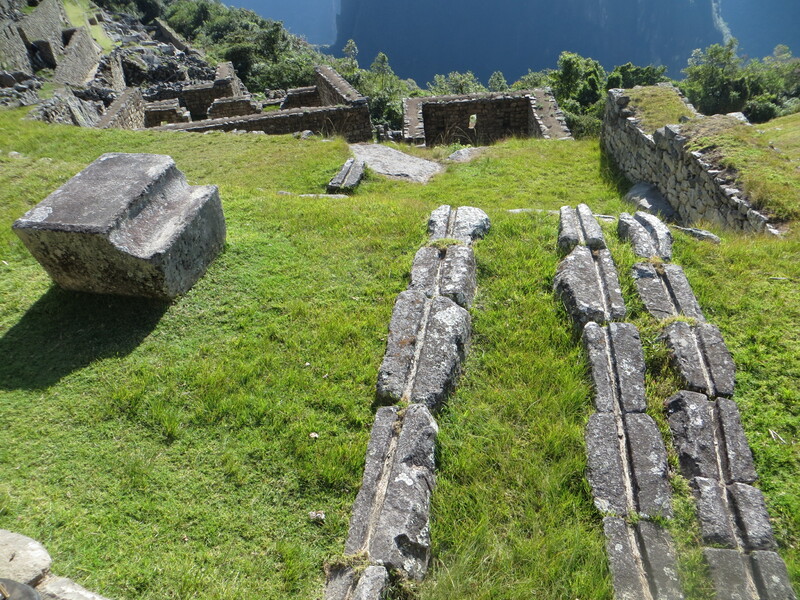 Like Wiñay Wayna, the city itself was laced with fountains, some of which were used for drinking and others for religious purposes. Our tour of the city focused on the religious temples, with the first one honoring Pachamama, “mother earth” or “mother world.” Unlike the temples we’d seen earlier, the Incas had carved it straight out of the mountain. Under a huge sloping ridge, there was a three-level symbolic staircase, which supposedly represented the sky, earth, and underworld. As appropriate to a people who believed in complementary opposites, the Pachamama temple was mirrored by the Sun Temple above it. The Sun Temple’s precise stonework contrasted with the natural slab below it. The differing styles perfectly illustrated the approach to each of those gods. 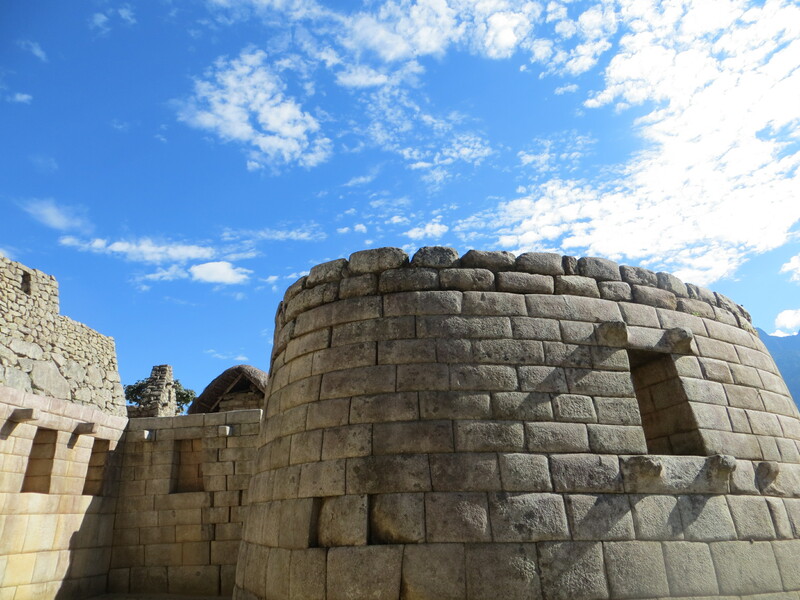 While the Pachamama temple was always in partial shade, the Sun Temple was always open to the sky. Like its other cousins in the ancient world, the Sun Temple had a special function on the solstice, when the sun shines precisely through its main window. Although not precisely bounding it, the Temple of the Condor is the Pachamama temple’s other complement. The bird’s body and beak were carved out of a stone that looked as if it grew from the dust itself. Two huge boulders, streaked in black and brown and looming over observers, symbolized its open wings. 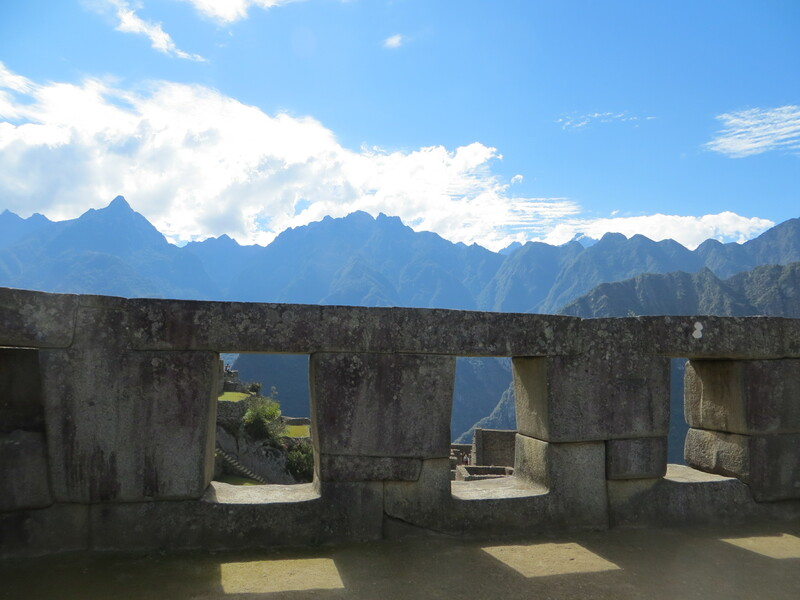 While the Pachamama temple was meant to anchor the people of upper Machu Picchu to the ground, the Temple of the Condor was meant to connect the people of lower Machu Picchu with the sky. The other side of the city had several more religious sites. The most historically significant is the Temple of the Three Windows. Bingham used this site to justify his theory that not only was Machu Picchu the last refuge of the Incas but also the birthplace of the first Inca. Currently, historians believe the three windows symbolize the father sun, the mother earth, and their duality. A little further on was the Hitching Post of the Sun, a sloped stone the priests used each winter solstice to “tie down” the sun, forcing it to reverse course towards earth. The one in Machu Picchu is particularly rare because it’s the only one the Spanish didn’t smash. Unfortunately, even that one isn’t perfect. While filming a beer commercial (of all things! ), a mechanical hand knocked into the stone and barely cracked it. On the same dais was another rock that looked as if it had emerged from the earth. Except that it perfectly mimicked the mountain behind it, down to its texture and lack of straight lines. 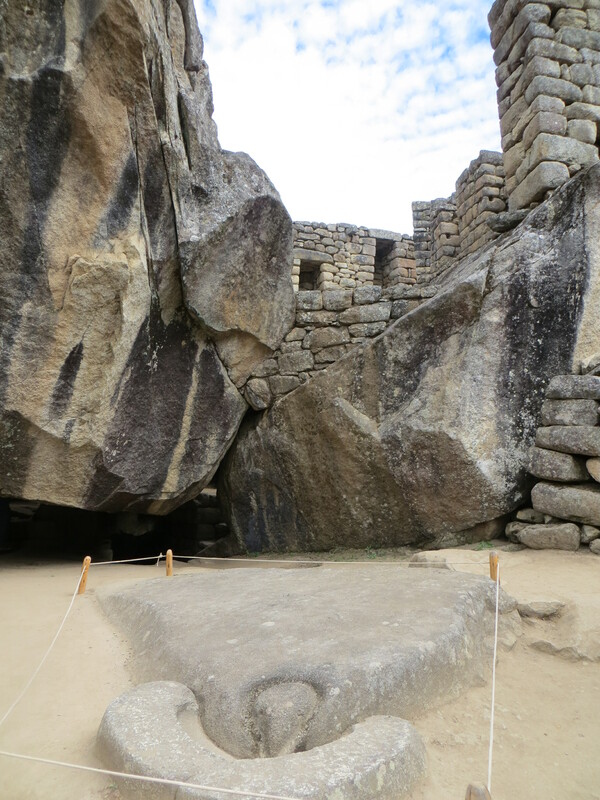 Because only the most important people could live near the religious sites, the priest’s and the Inca’s quarters were next to the Temple of the Sun. Even the king’s house couldn’t be as perfect as the house of the gods, so the stonework was just a little less precise. 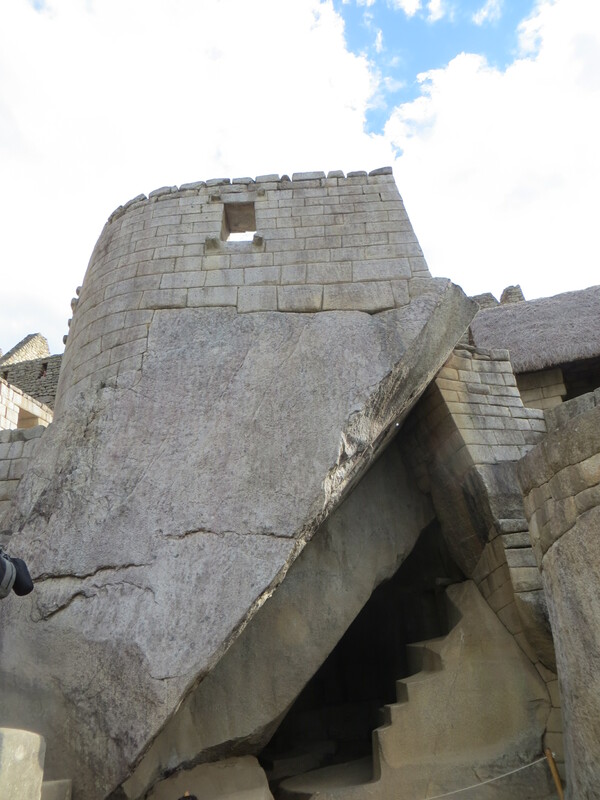 One feature we saw outside the Inca’s house was apparently the object of European historians’ runaway imagination. Our guide, Lobo, told us that Europeans thought one particularly large niche in the wall was for the Inca to tie up his pet puma. Considering that even the Incas didn’t try to domesticate the elusive cat, the hole had a much more ordinary purpose – to hold torches. As the relative humility of his house implies, the Inca was not as obsessed with power as some of the European kings. This may be in part because the Inca empire only lasted 300 years, with the royals living in Machu Picchu for less than 100. There was never much time for the Inca to rest on his laurels. The Inca society was also set up differently from the medieval feudal society. While serfs worked for the Lord of the Manor, everyone worked directly for the Inca empire itself. The various administrators assigned people jobs and ensured that they received food and shelter in exchange. Although there was significant social stratification, a talented and hard-working individual could earn some level of mobility. While the Inca rulers were probably far less benevolent than Bingham portrays, they also provided for their people in a way that many of the European governments failed to at the time. After a complete tour of the ruins, we left the site for lunch (which featured “goldfish ceviche”…hmm), and returned in the afternoon without Lobo. We walked to the one place we hadn’t visited – the Inca bridge. With the guardhouse of the Sun Gate on one side and the drawbridge on the other, the Incas could easily protect the city with only a few soldiers. While it was probably never up to modern safety standards, the bridge is in particularly bad shape these days. 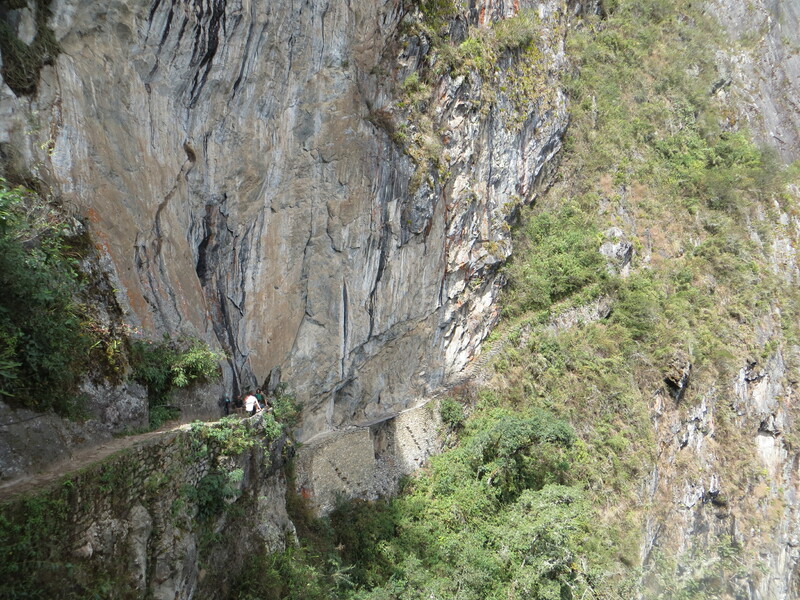 The Peruvian government allowed tourists to cross it until one person plunged to his death. Now, the bridge sits unused and deteriorating, a few logs crossed in front of it to indicate that it’s off limits. Compared to the glory of the rest of the ruins, it was rather pathetic. It was also outshown by the cliffs that soared above it, streaked in red and white. We then wandered around the ruins at leisure. Without a guide, it was obvious how little explanation the site provided and how uninterested the park rangers were in education. We realized that the Peruvian government seems to have a fundamentally different philosophy towards its national parks than the United States government. While the United States founded its national parks to protect the land for its people, the Peruvian parks appear to exist to protect the land from people, whether miners, tourists, or citizens. An inherently populist vision, based on the idea that exposure to nature builds moral righteousness, led to U.S. national parks full of educational plaques and free hikes. In contrast, the only place in Peru that had any interpretive signs at all was the small rangers’ station in Manu National Park. If a tourist is going to hire a guide anyway, why provide one for free? As we were no longer on the “official tour,” we wandered to some of the less visited areas. Walking through buildings that were once used for storage, we came upon another odd rodent. 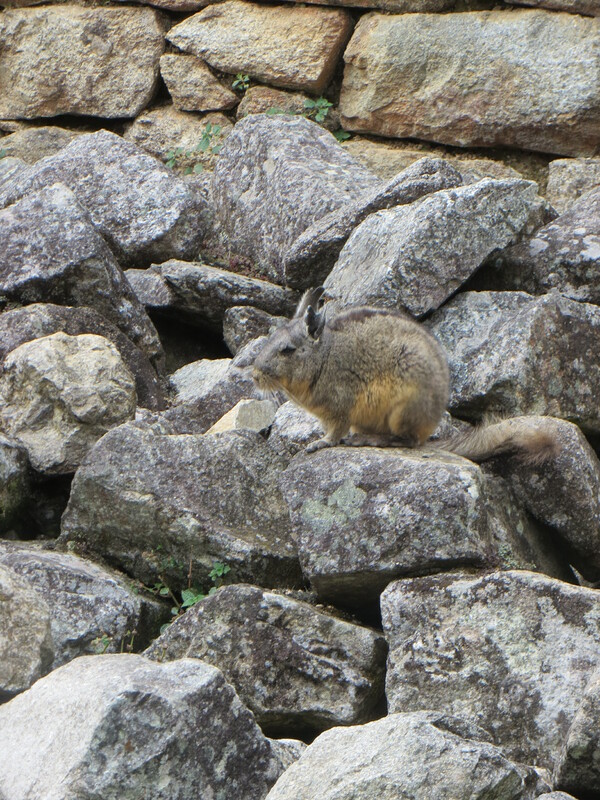 It was a viscacha, a creature that looks like a rabbit with a squirrel’s tail but is most closely related to chinchillas. We made our way back to Agua Calientes to catch the train via a noisy, colorful, kitschy souvenir market. With some time to spare, we celebrated the spirit of the Olympics by watching the opening ceremonies while sipping pisco sours with little umbrellas. Once we boarded the train, we realized that it was somehow less luxurious and more condescending than our trip there. Their “live entertainment” was a dancer in a garishly-colored, polyester version of the trickster outfit from Fiesta de la Virgen del Carmen. He traipsed down the aisles in a way that inspired a lot of awkward silence. After seeing the authentic, non-tourist version, I felt vaguely dirty. Fortunately, a young Brazilian man sitting next to us agreed that it was eye-roll inducing and appreciated snarky banter. With our last day behind us and only the flight home left, we went to sleep with our heads full of sights and stories. Now that I’ve finished the description of my trip, I want to hear yours! What’s the best vacation you’ve ever been on? The biggest adventure you’ve ever had outdoors? 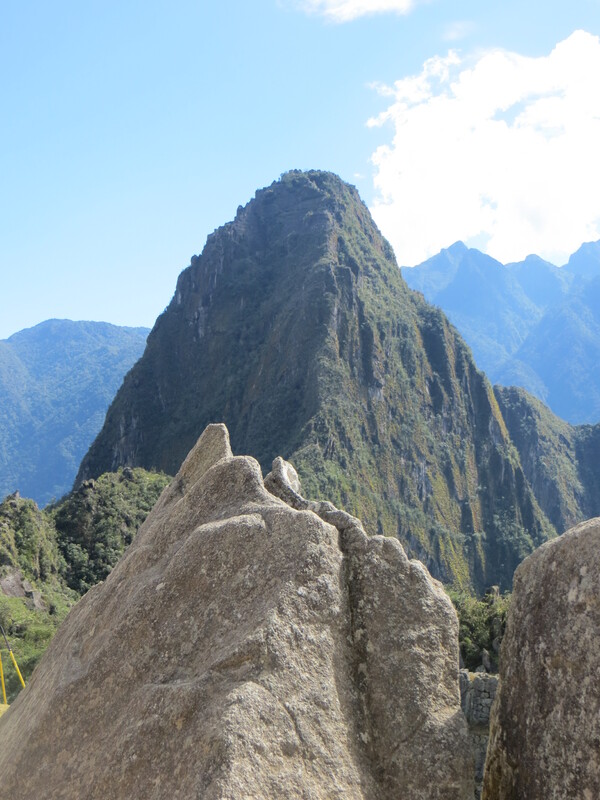 This entry was posted in family, travel and tagged Inca Trail, Machu Picchu, Peru, travel. Bookmark the permalink.